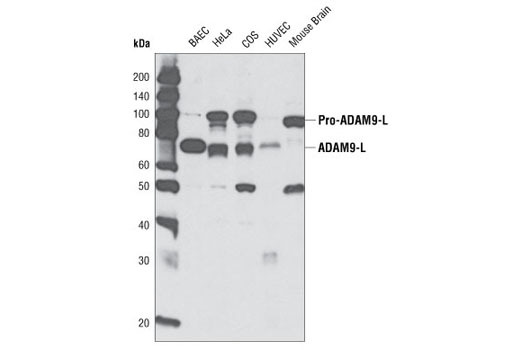 Western blot analysis of extracts from various cell types using ADAM9 Antibody. Immunoprecipitation of ADAM9 from HeLa cell extracts using ADAM9 Antibody. Western blot was performed using the same antibody. 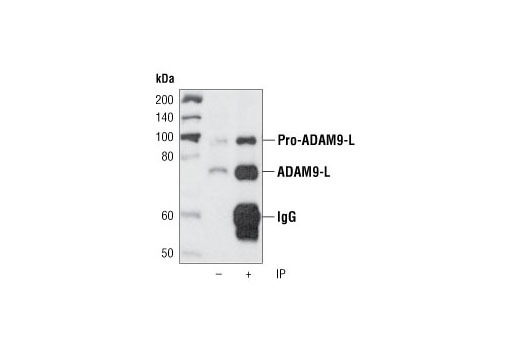 ADAM9 Antibody detects endogenous levels of total ADAM9 protein, unprocessed and active forms. The antibody does not recognize the carboxy terminally truncated short form of ADAM9. In some cell types, the antibody cross-reacts with a 50 kDa band of unknown origin. Polyclonal antibodies are produced by immunizing animals with a synthetic peptide corresponding to the carboxy terminus of human ADAM9. Antibodies are purified using protein A and peptide affinity chromatography. The ADAM (A Disintegrin and A Metalloprotease) family of multidomain membrane proteins influences cell signaling and adhesion by shedding cell surface proteins such as cytokines and growth factors, by influencing cell adhesion to the extracellular matrix (ECM), and by directly remodeling the ECM. Conserved domains in ADAM family members include a prodomain, a zinc-dependent metalloprotease domain, a disintegrin domain, a cysteine-rich domain, an EGF-like sequence, and a short cytoplasmic tail (1,2). The prodomain is thought to aid in protein folding. Disintegrin and cysteine-rich domains mediate adhesion, at least in part, through binding to integrins. Phosphorylation of the cytoplasmic tail as well as its interaction with other signaling proteins may influence intra- and extracellular signaling (1). ADAM9 is widely distributed and has been shown to affect migration in skin keratinocytes (3,4). Research studies have shown that ADAM9 is overexpressed in prostate cancer (5), pancreatic cancer (6), gastric cancer (7), and has been linked to invasion and metastasis in small cell lung cancer (8). Research has also shown that an alternatively spliced short (50 kDa) form of ADAM9 containing protease activity is involved in tumor cell invasion (9). Schlöndorff, J. and Blobel, C.P. (1999) J Cell Sci 112 ( Pt 21), 3603-17. Franzke, C.W. et al. (2002) EMBO J 21, 5026-35. Zigrino, P. et al. (2007) J Biol Chem 282, 30785-93. Fritzsche, F.R. et al. (2008) Eur Urol 54, 1097-106. Grützmann, R. et al. (2004) Br J Cancer 90, 1053-8. Carl-McGrath, S. et al. (2005) Int J Oncol 26, 17-24. Shintani, Y. et al. (2004) Cancer Res 64, 4190-6. Mazzocca, A. et al. (2005) Cancer Res 65, 4728-38.